A consumption tax is a tax on spending on goods and services. The term refers to a system with a tax base of consumption. It usually takes the form of an indirect tax, such as a sales tax or value added tax. However it can also be structured as a form of direct, personal taxation: as an income tax that excludes investments and savings. Since consumption taxes are argued to be inherently regressive on income, some current proposals make adjustments to decrease these effects. Using exemptions, graduated rates, deductions or rebates, a consumption tax can be made less regressive or progressive, while allowing savings to accumulate tax-free. A consumption tax essentially taxes people when they spend money. Under the income tax you're fundamentally taxed when you earn money or when you get interest, dividends, capital gains, and so on. With a consumption tax that wouldn't happen, you would be taxed essentially when you actually spent the money at the store. ... Under a consumption tax you'd actually pay tax on money you borrowed at the same time. So you wouldn't be taxed on your interest, dividends and capital gains, but you wouldn't be allowed a deduction for interest expense (Burman and Gale 2005). However it can also be structured as a form of direct, personal taxation: as an income tax that excludes investments and savings (Hall and Rabushka 1996, 281-320). This type of direct consumption tax is sometimes called an "expenditure tax," a "cash-flow tax," or a "consumed-income tax." A value-added tax (VAT) applies to the market value added to a product or material at each stage of its manufacture or distribution. For example, if a retailer buys a shirt for $20 and sells it for $30, this tax would apply to the $10 difference between the two amounts. A simple VAT would be proportional to consumption but also be regressive on income at higher income levels (as consumption falls as a percentage of income). Savings and investment are tax-deferred until they become consumption. A VAT may exclude certain goods, to try to make it less regressive. This tax is used in countries within the European Union. This form of national tax is known as a Goods and Services Tax (GST) in Australia, Canada, and New Zealand. In Canada it is also called Harmonized Sales Tax (HST) when combined with a provincial sales tax. A sales tax typically applies to the sale of goods, less often to the sales of services. The tax is applied at the point of sale. Laws may allow sellers to itemize the tax separately from the price of the goods or services, or require it to be included in the price (tax-inclusive). The tax amount is usually calculated by applying a percentage rate to the taxable price of a sale. When a tax on goods or services is paid to a governing body directly by a consumer, it is usually called a use tax. Often laws provide for the exemption of certain goods or services from sales and use tax. An excise tax is a sales tax that applies to a specific class of goods, typically alcohol, gasoline (petrol), or tourism. The tax rate varies according to the type of good and quantity purchased and is typically unaffected by the person who purchases it. The excise duty can account for as much as half the retail price of the goods subject to it, and sometimes more. Typically the excise is imposed as a fixed amount of tax per unit of measure, such as cents per gallon, as opposed to a percentage of sale price. The latter would be a sales tax. Expenditure tax is levied on the total consumption expenditure of an individual. This form of tax applies to the difference between an individual's income and increase/decrease savings. Like the other consumption taxes, simple personal consumption taxes are regressive with respect to income. However, because this tax applies on an individual basis, it can be made progressive. Just as income tax rates increase with personal income, consumption tax rates increase with personal consumption. The advantage is that it eliminates the supposed adverse effect of personal income tax on investment and saving incentives. However, it is difficult to administer and has been applied only with limited success in India and Sri Lanka. An early example of consumption tax was introduced by Emperor Augustus (27 B.C.E.) as an excise tax on goods, including slaves, sold in the public markets of Rome. The salt tax or the French gabelle was an unpopular tax imposed as a temporary expedient in 1286 and finally abolished in 1790). Consumption taxes, specifically excise taxes, have featured in several notable historic events. In the U.S., the Stamp tax, the tax on tea, and whisky taxes produced revolts, the first two against the British government and the latter against the nascent American Republic. In India, an excise tax on salt led to Gandhi's famous Salt Satyagraha, a seminal moment in his struggle to win independence from the U.K. It is a signal advantage of taxes on articles of consumption that they contain in their own nature a security against excess. They prescribe their own limit, which cannot be exceeded without defeating the end proposed—that is, an extension of the revenue. When applied to this object, the saying is as just as it is witty that, "in political arithmetic, two and two do not always make four." If duties are too high, they lessen the consumption; the collection is eluded; and the product to the treasury is not so great as when they are confined within proper and moderate bounds. This forms a complete barrier against any material oppression of the citizens by taxes of this class, and is itself a natural limitation of the power of imposing them (Federalist Paper No. 21). The basic idea comes down to the role of taxes in determining the rate of return on investment. Higher returns generate higher levels of investment and – as investment accumulates – higher levels of productive capacity. That increased capacity in turn generates higher levels of output, employment, and wages (Gordon, 2010). Gordon (2010) illustrates the difference in impact on investment between income and consumption taxes in the following examples. Example A illustrates the problem with income taxes: the wedge between the gross rate of return that is generated by the investment project and the net rate of return that the investor actually sees can reduce net returns to the point where marginal projects are not carried out. Output, employment, and wages will thus be reduced. EXAMPLE A: An investment project offers a rate of return of 10 percent. The gross return on an investment of $100 may be $10, but after applying a (say) 30 percent corporate tax on those profits and a marginal income tax of (say) 40 percent, the return that the investor sees on her savings is reduced from $10 to $4.20 (Gordon, 2010). The second example, on the other hand, implements a consumption tax instead of taxing income and profits. Even when the consumption tax rate is 100 percent, it still does not introduce a tax wedge between gross and net rates of return. EXAMPLE B: The investor is faced with a consumption tax of (say) 100 percent so that $100 can purchase $50 worth of consumer goods. If there are no taxes on profits or on income, the entire $10 return is remitted, which can then be used to buy $5 worth of consumer goods. The sacrifice of $50 in consumer goods has generated a return of $5 of consumer goods, so the effective rate of return is still 10 percent (Gordon, 2010). Consumption taxes are generally neutral with respect to investment (Andrews 2005; Greenspan 2005). Ehrbar observes that a tax is “neutral” if it does not "alter spending habits or behavior patterns and thus does not distort the allocation of resources." (Ehrbar 2005). In other words, taxing apples but not oranges will cause apple consumption to decrease and orange consumption to increase, and therefore is not a neutral tax. The temporal neutrality of a consumption tax, however, is that consumption itself is taxed, so it is irrelevant which goods or services are being consumed. The only possible effect on neutrality is between consumption and savings. Taxing only consumption should, in theory, cause an increase in savings (Andrews 2005). Depending on implementation (such as treatment of depreciation) and circumstances, income taxes either favor or disfavor investment. By not disfavoring investment, a consumption tax might increase the capital stock, productivity, and therefore increase the size of the economy (Andrews 2005; Auerbach 2005). The basic difference between an income tax and a consumption tax is that a consumption tax taxes money only when it is spent. An individual or family's income often varies dramatically from year to year. The sale of a home, a one time job bonus, and various other events can lead to temporary high income that will push a low or middle income person into a higher tax bracket. On the other hand, a wealthy individual may be temporarily unemployed and pay no taxes. Consumption tax, by taxing actual expenditures, thus more closely tracks long run average income (Auerbach 2005). Income taxes, by contrast, tax all the earned income—including amounts put away in savings and any amounts paid in interest. 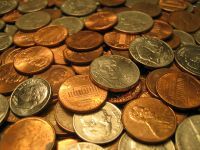 Critics of income tax claim that the current system artificially increases the incentive to spend, while a consumption tax would encourage people to save and invest. One of the first detailed analyses of a consumption tax was developed in 1974 by William Andrews (Andrews 1974). Under this proposal, people would only be taxed on what they consume, while their savings would be left untouched by taxation. In his article, Andrews also explains the power of deferral, and how the current income tax method taxes both income and savings. For example, Andrews offers the treatment of retirement income under the current tax system. If, in the absence of income taxes, $1 of savings is put aside for retirement at 9 percent compound interest, this will grow into $8 after 24 years. Assuming a 33 percent tax rate, a person who earns $1 will only have $0.67 to invest after taxes. This person can only invest at an effective rate of 6 percent, since the rest of the yield is paid in taxes. After 24 years, this person is left with $2.67. But if this person can defer taxation on these savings, such as in an Individual Retirement Account (IRA), he will have $8 after 24 years, taxed only once at 33 percent, leaving $5.33 to spend. Inflation is obviously an issue here, but the most important point is to move the tax from income to consumption. This is the primary concept of the consumption tax—the power of deferral. Even though the person in the above example is taxed at 33 percent, just like his colleagues, deferring that tax left him with twice the amount of money to spend in retirement. Had he not saved that dollar, he would have been taxed, leaving $0.67 to spend immediately on whatever he wanted. Harnessing the power of deferral is the most important concept behind a consumption tax. However, this raises the relative burden on low savers, who are low and moderate income households, so almost any revenue neutral shift from the income tax to a consumption tax will be regressive (Burman and Gale 2005). An income tax is a tax that governments impose on financial income generated by all entities within their jurisdiction. It places taxes on business profit and on employees' wages. Income tax is a key source of funds that the government uses to fund its activities and serve the public. Most individuals do not pay tax on all of their income. Rather, the IRS offers a series of deductions, including mortgage interest, a portion of medical and dental bills, education expenses, and several others, which taxpayers subtract from their gross income to determine their taxable income. For example, if a taxpayer earns $100,000 in income and qualifies for $20,000 in deductions, the IRS only taxes the remaining $80,000. Additionally, tax payers may be eligible for a variety of credits for items such as child and dependent care, college tuition, alternative fuels, and so forth, which further reduce the tax burden. A coherent argument offered by advocates of consumption taxation against income taxation is that of Irving Fisher, based on suggestions of John Stuart Mill. Fisher argued that, since the goal of all production is consumption, and since all capital goods are only way-stations on the way to consumption, the only genuine income is consumption spending. Based on consumption, rather than income, a national sales tax would not discriminate against saving the way the income tax does. Accordingly, it may increase the level of private saving and generate a corresponding increase in capital formation and economic growth. A broad-based sales tax would almost certainly distort economic choices less than the income tax does. In contrast to the income tax, it would not discourage capital-intensive methods of production. The conclusion is quickly drawn that therefore "only consumption income, not what is generally called 'income,' should be subject to tax." (Rothbard 1977: 98–100). Governments worldwide increasingly recognize consumption taxes, especially general consumption taxes, as an important source of tax revenues. In the past five decades, more than 150 countries have implemented a value-added tax (VAT). Revenues from consumption taxes currently represent, on average, 30 percent of all tax revenues and social security contributions (OECD, 2014). Consumption taxes are believed to be more efficient than other types of taxes as their impact on the allocation of resources in the economy is less pronounced. Competitive markets tend to allocate resources, such as capital or labor, to their best or most-valued uses, resulting in relatively less expensive goods and services for customers. General consumption taxes applied on all goods and services do not affect patterns of consumption or the allocation of resources among sectors of the economy. In reality, however, to lessen their regressive nature, rebates must be given or exemptions are made so that consumption taxes are not applied on all goods and services. The reduced economic efficiency associated with such rebates and/or exemptions must be weighed against their benefits (Stuckey and Yong, 2011). In the earlier example analyzed by Andrews, the equation for the government is the opposite of what it is for the taxpayer. Without the IRA tax benefits, the government collects $5.33 from the $1 saved over 24 years, but if the government gives the tax benefits, the government collects only $2.67 over the same period of time. The system is not free. Regardless of political philosophy, the fact remains that a government needs money to operate, and will have to get it from another source. The upside of the consumption tax is that, because it promotes savings, the tax will encourage capital formation, which will increase productivity and economic activity (Andrews 2005; Auerbach 2005). Secondly, the tax base will be larger because all consumption will be taxed. Economists have noted that the main drawback of consumption taxes is that they hit low-income households hardest. Therefore it is important to complement them with measures such as rebates in order to correct the regressive effects (Gordon, 2010). The regressivity may also be lessened by exempting necessities like food, clothing, and medicine, or taxing them at a lower rate. However, such measures make the tax more complex, reducing the efficiency advantages of this type of tax (Burman, 2012). The regressive nature of consumption taxes is shown in the shrinking of the ratio of tax obligation as wealth grows, because the wealthy spend proportionally less of their income on consumables (Metcalf 1997). Setting aside the question of rebates, a working class individual who must spend all his income will find his expenditures, and therefore his income base, taxable at 100 percent, whereas wealthy individuals who save or invest a portion of their income will only be taxed on the remaining income. This argument assumes that savings or investment is never taxed at a later point when consumed (tax-deferred). In theory you can set up a consumption tax to have any group of households pay it. In the real world, every consumption tax out there is going to hit low and middle income households to a greater extent than the income tax does. ... the main reason is that low and middle income households consume more of their income than high income households do. Another way of saying that is high income households save more of their income than low income households do. So if you move the tax from income to consumption, you're raising the relative burden on low savers, which are low and moderate income households, so almost any revenue neutral shift from the income tax to a consumption tax will be regressive in that manner. (Burman and Gale 2005). A consumption tax could utilize progressive rates in order to maintain "fairness." The more someone spends on consumption, the more they will be taxed. Here, to maintain “real fairness” the different rate structure for necessities as opposed to luxury items might be introduced so that the “regressive” nature of consumption tax could be alleviated. The above benefits notwithstanding, there is still a problem. It has been estimated that in order to replace all taxes with sales tax (consumption or VAT), the sales tax rate would be something like 60 percent (Burman and Gale 2005). If the United States, for example, replaced income tax with a consumption tax alone, there are some potential behavioral changes to be anticipated. Changes in buying behavior: Removal of income taxes necessitates filling the revenue gap. The sales tax rate, and/or the sales tax base (the items subject to sales tax), will increase. This results in less apparent buying power for the dollar. When taxed on consumption, people may think twice before making a purchase. However this is counterbalanced by an increase in the paycheck: Abolishing income tax means no tax withholding in the paycheck, which is equivalent to receiving a small increase each paycheck . Some basic necessities, like food or medicine, may not be taxed in an attempt to decrease the tax burden on those struggling to get by. Frugal shoppers who buy only the basics may pay less taxes than under the income tax system. April is no longer daunting: All taxes owed are paid during sales transactions (Grossman, 2015). It has been suggested that one effect of moving away from income tax to consumption tax would be to change people’s economic behavior by increasing saving and reducing spending. Some economists favor a consumption tax because they think it would reduce the penalty on savings. Basically savings would not be taxed so there would be an incentive to do more of it. However, under the current system there are tax breaks for saving, such as Individual Retirement Accounts (IRA), which would disappear with a move to consumption taxation and so reduce the incentive to save. Therefore, the actual increase in savings might not be significant (Burman and Gale, 2005). Having challenged the merits of the goal of taxing only consumption and freeing savings from taxation, we can now proceed to deny the very possibility of achieving that goal, i.e., we maintain that a consumption tax will devolve, willy-nilly, into a tax on income and therefore on savings as well. In short, that even if, for the sake of argument, we should want to tax only consumption and not income, we should not be able to do so (Rothbard 1994). EXAMPLE: Let us take a seemingly straightforward tax plan that would exempt saving and tax only consumption. For example, Mr. Jones earns an annual income of $100,000. His time preferences leads him to spend 90 percent of his income on consumption, and save-and-invest the other 10 percent. On this assumption, he will spend $90,000 a year on consumption, and save-and-invest the other $10,000. Let us assume now that the government levies a 20 percent tax on Jones' income, and that his time-preference schedule remains the same. The ratio of his consumption to savings will still be 90:10, and so, after-tax income now being $80,000, his consumption spending will be $72,000 and his saving-investment $8,000 per year. Suppose now that instead of an income tax, the government follows the Irving Fisher scheme and levies a 20 percent annual tax on Jones' consumption. Fisher maintained that such a tax would fall only on consumption, and not on Jones' savings. But this claim is incorrect, since Jones' entire savings-investment is based solely on the possibility of his future consumption, which will be taxed equally. Since future consumption will be taxed, we assume, at the same rate as consumption at present, we cannot conclude that savings in the long run receives any tax exemption or special encouragement. There will therefore be no shift by Jones in favor of savings-and-investment due to a consumption tax. In sum, any payment of taxes to the government, whether they are consumption or income, necessarily reduces Jones' net income. Since his time preference schedule remains the same, Jones will therefore reduce his consumption and his savings proportionately. The consumption tax will be shifted by Jones until it becomes equivalent to a lower rate of tax on his own income. If Jones still spends 90 percent of his net income on consumption, and 10 percent on savings-investment, his net income will be reduced by $15,000, instead of $20,000, and his consumption will now total $76,000, and his savings-investment $9,000. In other words, Jones' 20 percent consumption tax will become equivalent to a 15 percent tax on his income, and he will arrange his consumption-savings proportions accordingly. Consumption taxes distort what would have happened without them. Because the price rises, the quantity of goods traded decreases. Correspondingly, some people are worse off by more than the government is made better off by the income from the tax. That is, more is lost due to supply and demand shifts than is gained in tax. This is known as a deadweight loss. The income lost by the economy is greater than the government's income; the tax is inefficient. The entire amount of the government's income (the tax revenue) may not be a deadweight drag, if the tax revenue is used for productive spending or has positive externalities—in other words, governments may do more than simply consume the tax income. While distortions occur, consumption taxes like VAT are often considered superior because they distort incentives to invest, save and work less than most other types of taxation—in other words, a VAT discourages consumption rather than production. Government's tax income: the grey rectangle that says "tax"
↑ We set aside the fact that, at the lower amount of money assets left to him, Jones' time preference rate, given his time preference schedule, will be higher, so that his consumption will be higher, and his savings lower, than we have assumed. ↑ In fact, per note , supra, there will be a shift in favor of consumption because a diminished amount of money will shift the taxpayer's time preference rate in the direction of consumption. 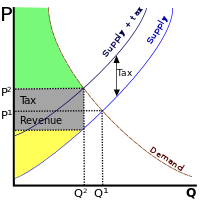 Hence, paradoxically, a pure tax on consumption will and up taxing savings more than consumption (Rothbard 1981: 108–111). where G = gross income, t = the tax rate on consumption, and c, consumption as percent of net income, are givens of the problem, and N = G – T by definition, where T is the amount paid in consumption tax. Andrews, Edmund L. 2005. Fed's Chief Gives Consumption Tax Cautious Backing The New York Times, March 4, 2005. Retrieved September 29, 2016. Andrews, William D. 1974. "A Consumption-Type or Cash Flow Personal Income Tax." Harvard Law Review 87: 1113. Auerbach, Alan J. 2005. A Consumption Tax, The Wall Street Journal, August 25, 2005. Retrieved September 29, 2016. Bergevin, Philippe. 2007. A Primer on Federal Consumption Taxes Parliament of Canada. Retrieved October 13, 2016. Burman, Len. 2012. A Progressive Consumption Tax? Forbes, June 4, 2012. Retrieved October 12, 2016. Burman, Len and William Gale. 2005. The Pros and Cons of a Consumption Tax Brookings interview. Retrieved September 29, 2016. Ehrbar, Al. 2008. Consumption Tax, The Concise Encyclopedia of Economics, Library of Economics and Liberty. Retrieved September 29, 2016. Gordon, Stephen. 2010. Why economists love consumption taxes The Globe and Mail, September 10, 2012. Retrieved October 4, 2016. Greenspan, Alan. 2005. Consumption Tax Could Help Economy, Fox News, March 3, 2005. Retrieved September 29, 2016. Grossman, Amanda. 2015. Consumption Tax vs. Income Tax: Why More States Are Opting to Collect Consumption Taxes Only How Money Walks, March 16, 2015. Retrieved October 12, 2016. Hall, Robert E., and Alvin Rabushka. 2006. The Flat Tax. Hoover Institution. Retrieved September 29, 2016. Hamilton, Alexander. Federalist Paper No. 21. Retrieved September 29, 2016. Metcalf, Gilbert E. 1997. The National Sales Tax: Who Bears the Burden? The Cato Institute. Retrieved September 29, 2016. Opinion Journal. 2008. America the Uncompetitive, The Wall Street Journal, August 15, 2008. Retrieved September 29, 2016. Regnier, Pat. 2005. Just how fair is the FairTax? Money Magazine, September 7, 2005. Retrieved September 29, 2016. Rothbard, Murray N. 1977. "Toward a Reconstruction of Utility and Welfare Economics." Journal of Libertarian Studies. Rothbard, Murray N. 1988. "Review of A. Chafuen, Christians for Freedom: Late Scholastic Economics." International Philosophical Quarterly 28 (March): 112–114. Rothbard, Murray N. 1994. The Consumption Tax: A Critique. Review of Austrian Economics 7(2): 75–90, online at Mises Daily. Retrieved October 12, 2016. Stuckey, Brett, and Adriane Yong. A Primer on Federal Consumption Taxes Parliament of Canada. Retrieved October 13, 2016. All links retrieved March 22, 2017. A Consumption Tax or an Income Tax? by Llewellyn H. Rockwell, Jr. This page was last modified on 22 March 2017, at 22:08.